With affordable prices and all work carried out on your vehicle fully warranted - why go somewhere else? 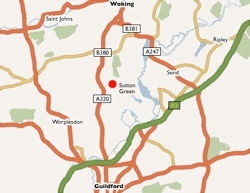 Sutton Green Garage operates in modern premises near Guildford, Surrey. Call us on 01483 715234 today and we will soon have you on the road!